The elegant and efficient e-House blends the ethos of Balinese spaces and early Australian homesteads. Linked pavilions create highly functional living spaces that flow to a beautiful northern courtyard which is perfect for all year round entertaining. A raked pyramidal ceiling is a stunning feature in the large central pavilion. Thermally stable and beautifully proportioned, the e-House combines cutting edge contemporary design with superb comfort no matter what the temperature outside is. 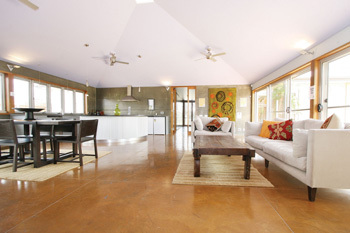 Read our case study on an E-House built in Watson in Canberra.